Everyone loves the ambiance that a wood-burning stove provides, but not everyone wants to deal with the cost associated with purchasing wood as fuel, or the work that goes into cutting large chunks of wood into more manageable, fireplace-appropriate pieces. Many homeowners are balancing their desire for comfort and nostalgia with their desire for simplicity and convenience by purchasing either electric or gas fireplaces. While both types of fireplaces are easier to maintain and use than wood fireplaces, it is very difficult for the average homeowner to choose between them. Let’s take a closer look at the benefits of both types of fireplaces, so you can familiarize yourself and make a more informed decision about which is better for your home. As you can see from the above benefits of electric fireplaces, it’s very easy to see why they are becoming so popular amongst homeowners with small spaces and/or have a tight budget. To further help you make a decision about which type of fireplace you want to install in your home, here is a closer look at each of the benefits they share, as well as the benefits that are unique to each of them. 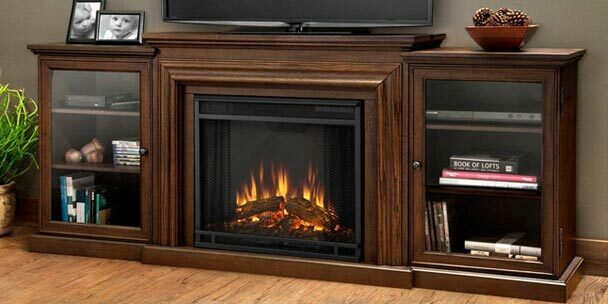 Electric fireplaces are impressively inexpensive, with some models running as low as $99. When compared with the cost of a genuine wood-burning fireplace, the electric fireplace becomes even more appealing. Gas fireplaces are not quite as inexpensive as electric fireplaces, especially when you factor in the installation costs. However, when you compare the cost of installing a wood-burning fireplace with installing a gas fireplace, the gas fireplace is more financially desirable. Both electric and gas fireplaces are designed to look as natural as possible, and typically include realistic-looking logs that appear to light on fire just like a real wood-burning fireplace. If you love the way a wood burning fireplace looks and feels on a chilly evening, you can achieve a very similar feeling with a gas or electric fireplace, although it is important to note that the flames in a gas fireplace typically look more realistic than those in an electric fireplace. If you purchase an electric fireplace, you will not need to install a gas line or a chimney, which reduces your costs even further. A gas fireplace needs to be hooked up to a gas line, but typically this does not cost a lot of money because most modern homes are already hooked up to a gas line. If your home does not currently use gas to power any appliances, then you may be faced with higher costs if you decide to purchase a gas fireplace. One of the most desirable traits shared by both electric and gas fireplaces is their convenience factor. Homeowners these days are often very rushed and tired, which is why they do not want to come home and start a fire from scratch in a genuine wood fireplace. With both electric and gas fireplaces, the only thing you need to do in order to immediately achieve warmth and comforting ambiance is push a button. This convenience is one of the most attractive benefits for both of these fireplaces. With a natural wood-burning fireplace, you should expect to have the chimney cleaned on a regular basis to ensure that there is not a buildup of dangerously flammable materials. With electric and gas fireplaces, very little maintenance is required. Both electric and gas fireplaces add instant value to your home, but an electric fireplace adds minimal value, while a gas fireplace adds much more value. Although it costs more to install a gas fireplace than an electric fireplace, you may be able to recoup up to 91% of that cost when you sell your home. As you can clearly see, you can enjoy many benefits by purchasing either a gas or an electric fireplace, including ambiance, convenience, and low costs. In order to decide which type of fireplace is the right fit for your home, carefully weigh the pros and cons of each so that you can make the best decision for your unique situation. I understand that you are encouraging electric fireplaces and have nothing against them, but one advantage of gas you didn’t mention is that it still provides heat if the power is off. We have a customer going that route for that very reason. Good write-up, though.